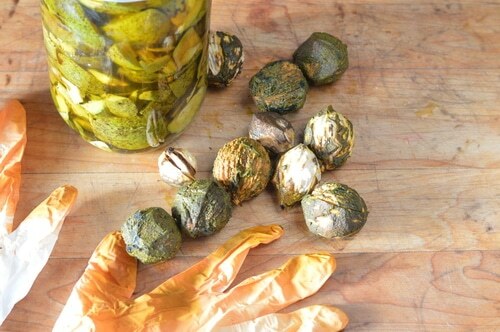 Make black walnut tincture with the green hulls from black walnuts for its antifungal properties or as an external iodine supplement. Many people think of black walnut trees as a nuisance. They drop their nuts with green hulls on driveways, roadways, and lawns. If they aren’t picked up immediately the green fruit rinds turn black and stain sidewalks and driveways. They leave behind a slippery mess that just gets worse in the freeze-thaw periods of fall. Then there’s the nuts – a hard nut. Black walnuts defy cracking with ordinary measures. Only extraordinary techniques can release the delicious nut meats from their hard prison. It seems that few people today value the fruit of the black walnut tree. But I would like you to examine this treasure of nutrition and herbal medicine with fresh eyes. 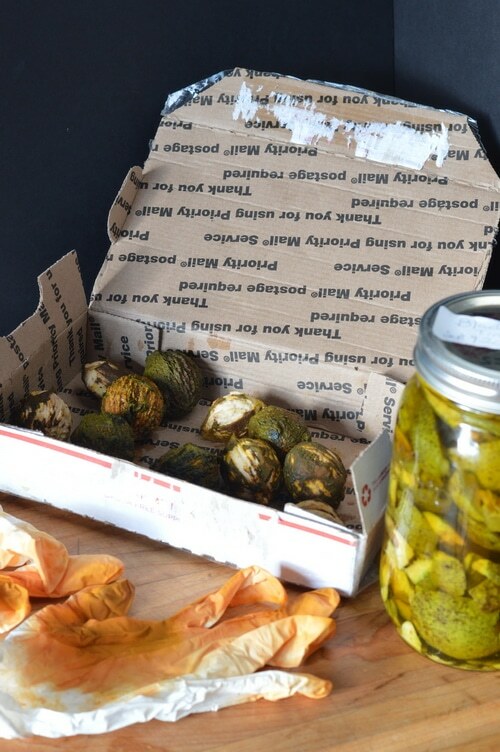 Recently I was given a box of 10 fresh, fleshy, still green black walnuts in their hulls. I was delighted because I have a single black walnut tree about 12 years old, and I wanted to add a few more black walnut trees to my permaculture garden. However living in BC, I wasn’t able to find any local black walnut trees to gather nuts for planting. The fruit of the black walnut tree has two parts – a fleshy hull that covers a hard nut in a shell. Using a knife I cut the fleshy, green hull from the nut. I set this hull aside to make an easy herbal tincture. The nuts need to be planted before they dry out to ensure good germination. I did a float test to check the nuts for viability. Out of the 10 black walnuts, 5 sunk to the bottom of the sink of warm water. These are the ones I used for planting. I planted the nuts in damp sand, in a planting pot and buried the pot in the garden, with a piece of hardware cloth over the top of the pots to discourage squirrels from digging up the nuts. I covered the hardware cloth with a few inches of dirt and marked the spot so that I could find it again in the spring. The nuts require a chill period before sprouting. They’ll get that over our long zone 3 winter – about 5 ½ months covered in snow. In the spring I’ll wait for the nuts to germinate and then move the sprouted nuts to a new pot with soil. Black walnut trees exude juglans, a plant substance that prevents other plants from growing near a black walnut tree. If you plan to put a black walnut in your back garden you may be disappointed when you find that your asparagus, strawberries, and rhubarb struggle. However, there are a few plants that are unaffected by juglans. Here’s a list of 30 plants that are hardy in zone 3, that are good neighbors to black walnut. The green hull is the part that herbalists are most interested in. It’s important when making a black walnut tincture to use the hulls before they turn black or become bruised. So choose walnuts that are a little under-ripe for best results. I used the walnuts that I had which were about half fully ripe and half were under ripe. All the flesh was green with only a few flecks of brown. The hulls were about a ¼ inch thick and quite fleshy, with a strong iodine smell. You’ll recognize that smell when you cut into one. It smells just like the iodine that is sold for veterinary wound care. Black walnut hulls are a strong natural source of iodine. They are nourishing to the thyroid, especially where seaweed is hard to source. Take note of where you can find black walnut trees growing near you. This may be helpful, should you ever find yourself in need of iodine to protect from nuclear radiation, especially radioactive iodine, which can be absorbed by your thyroid in a situation where you are iodine deficient. During the Chernobyl nuclear disaster, the areas in the fallout zone ran out of potassium iodide and seaweed sources of iodine. They used black walnut tincture as an iodine supplement by painting people’s knee skin with it. It was effective in preventing radiation poisoning of the thyroid in those treated with it. (That’s iodine on the glove). Walnut hulls are also a good source of vitamin C, which helps your body release toxins. Black walnut hulls are antifungal and anti-parasitic, especially for intestinal parasites. They are also an antimicrobial, blood cleansing, detoxifying tonic. They have some sedative properties. However, they are not an herbal supplement that should be taken daily. Black walnut hulls can be used externally to help with warts and herpes. To use it as an iodine supplement paint the tincture on the skin of the knees, rather than taking it internally. It can be used as an antiviral, antifungal or to expel parasites when taken internally. However, because it is such a powerful supplement its use should be limited to no more than 2 weeks at a time. 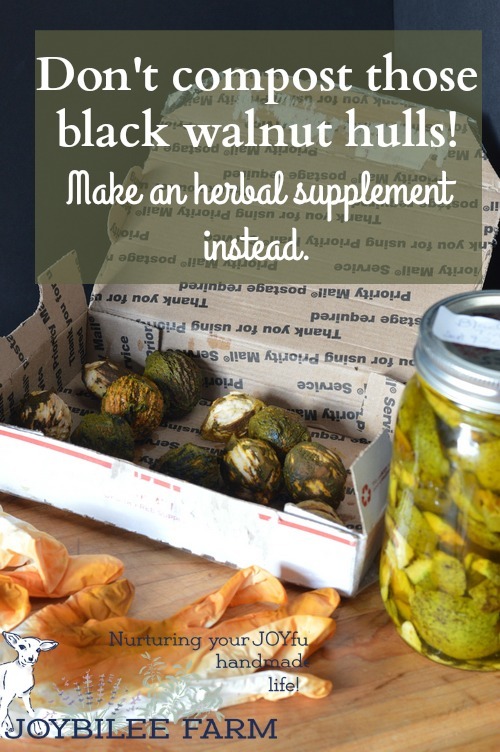 Fill a quart jar with fresh black walnut hulls. Pour 40% vodka over them. Generally, an herbalist would use an alcohol of at least 50% or 100 proof for this preparation, but where I live you can’t easily find vodka with a higher alcohol percentage. The tincture is still strong enough even with a lower alcohol percentage. Cap tightly. Label and date the jar. Shake the jar once a day or as often as you think of it. After 6 weeks, strain the jar contents, reserving the liquid. 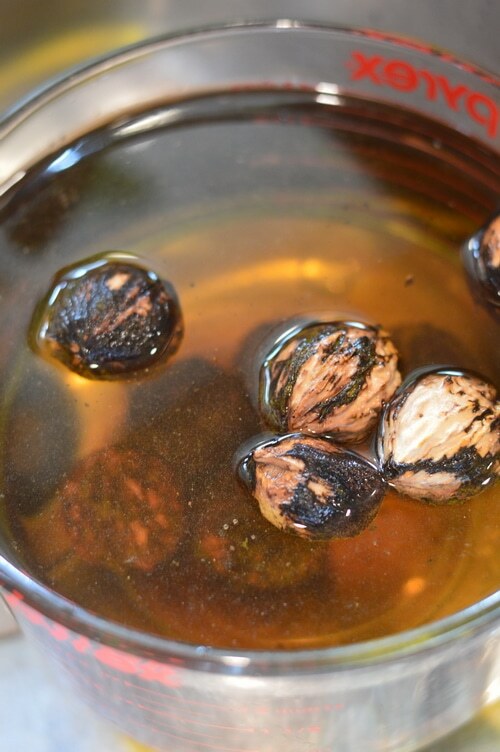 Press the spent walnut hulls with a potato ricer or other press, to capture as much of the tincture as possible. Discard the walnut hulls. Pour the completed tincture into amber glass bottles. Cap with a dropper lid. Label and date. The tincture will be good for years. Iodine is very stable. The normal dosage of this tincture is very low since the herbal remedy is so strong. 15 drops can be taken in water, 3 times a day. To use it as an iodine supplement it’s just as effective to paint the skin with it as it is to take it orally. The tincture is 1:2 in 50% alcohol, the Usual supplement is 15 drops 3 to 4 times daily. (20 drops is equal to 1 ml). Contraindications: It shouldn’t be used by those allergic to tree nuts, or by pregnant or nursing mothers. If you are looking for nuts for planting and you live in the USA, my friend Janet, of Timber Creek Farm, has black walnuts available for sale, seasonally. Check out her Etsy store for more information. Other uses for black walnut include making natural dyes and homemade ink. I just harvested my trees and have a bunch for sale ! I have black walnut trees & they’re dropping nuts. I can’t wait to make some tincture. Is the main reason for using green hulls instead of black, to avoid the mold? Any other reasons? Hi my name is Tara, I also have a couple black walnut trees outside my home I’ll ship to anyone who will pay for shipping ! I have 2 6 week old puppies that have been dewormed but is almost due for another treatment. Is it safe to use this method on these babies? Can the tincture be used as a flavoring in cooking? If not,can a flavoring be made at home? No the tincture is not for flavoring. You can make walnut flavoring by using the nut meats in alcohol. 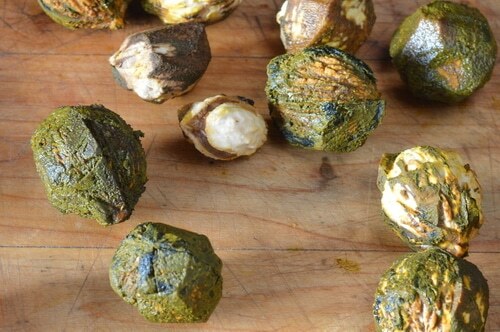 Never use the green hulls for food. Can i throw the hulls in boiling water and make a strong tea ? It would be unpleasantly bitter. And it could be dangerous to drink it unless you are dealing with worms. It’s one of the herbs I recommend only using internally under the supervision of a clinical herbalist. Given the effects of Juglan on other plants, can the used hulls be composted after tincturing? Or will the Juglan be present in the finished compost? Also, I gather the leaves can be tinctured too. Any thoughts on that? I have a HUGE old black walnut tree in my back yard that bombards my house with the huge walnuts. Someone just told me to look up what i can use them for. Thank you! I have a zillion, so if anyone wants some I will gladly mail them to you if you want to pay for the shipping! Do you still have any black walnuts? Please email me if you do. I have a huge walnut tree that is bombarding early nuts. If you need them, just let me know. I just built a new home in rural PA and there are several trees in my yard. We considered cutting them because of the mess but they are pretty, almost tropical looking. I was recently diagnosed with Lymes Disease and someone told me about this tincture. Thanks for posting! Wow, the things I learn from you ! Thank you. I have always applied oils to the bottom of my feet, it is interesting that this is applied to the knees, wow. In California, the Black Walnuts are grafted with English Walnut (the traditional eating walnuts), I’ve had a few trees die back and now they produce only Black Walnuts, so I will give this a try. The only walnut hulls I have have already started to turn black in places and the flesh is extremely soft. Basically, falling off the nut shell. Can I still use this hull flesh? If there is no mold you can use it for a tincture. But if you could find green hulls it would be better. Walnut hulls are also used as a dewormer/anti-parasitic. How much effort do you put into cleaning the gunk off the nuts themselves? I have rinsed and scrubbed them as many as five times before laying them out to dry and then February or March I sit down and shell them. But I’m wondering if I’m making them cleaner then they need to be? What’s your process? I usually just rinse and scrub once and then let them dry. The residual hull dries and will flake off for me. You just want to watch for mold. Thank you for the excellent information in this post! I always learn so much from you! Thank you for spending the time researching all of this! Thank you, Chris! We have a walnut tree that is finally bearing – after over twenty years! We have let it fruit for the biblical four years, and we are now able to use the nuts and hulls! 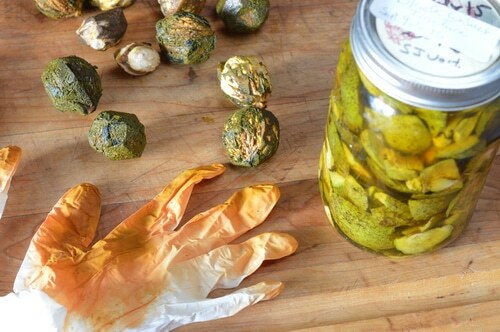 This recipe looks very valuable for the home medicinal pantry! I am grateful for your work!! I’m having an impossible time logging in, getting accepted for ebook, etc. Help! Love this site – also tried forwarding it to friends but that didn’t work either. Appreciate your help. Thank you. Moon, you could try again today. Yesterday there was a internet outages in some places and some of my readers were affected. While my website is based in Canada and wasn’t affected by the outage, the company that manages my email list and ebook deliver was affected. Sorry for the inconvenience. I’m so happy to help, Rachel. Rachel, you posted almost 2 years ago. I am just now seeing this info regarding black walnuts and saw your statement …”We have let it fruit for the biblical four years, and we are now able to use the nuts and hulls”. Could you please give your references regarding your statement? I have tried to find it, but I am unable to locate. If you see this, would you mind responding? Please and Thanks. I need a few….Any green walnuts this time of year? I will take a few off your hands. Please let me know soon….Thanks. Lovely! 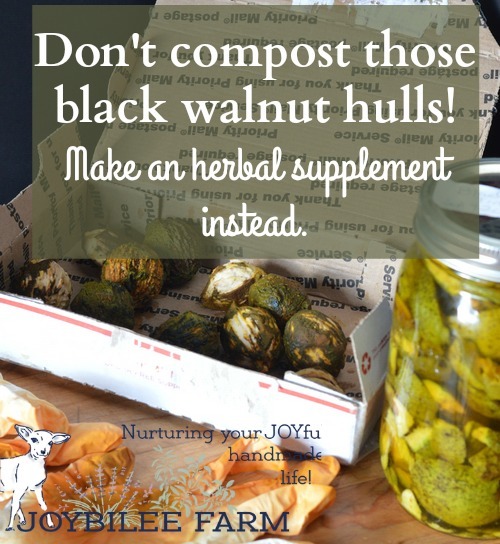 I remember my living in Tennessee, the farm we lived on had a bunch of black walnuts – I always wanted to do this, but life seemed to steal it… however I think I will add it to my goal list for 2017 – herbal pantry plan. 🙂 ~ Blessings!